The largest contemporary Two Grey Hill weaving we have had in years. 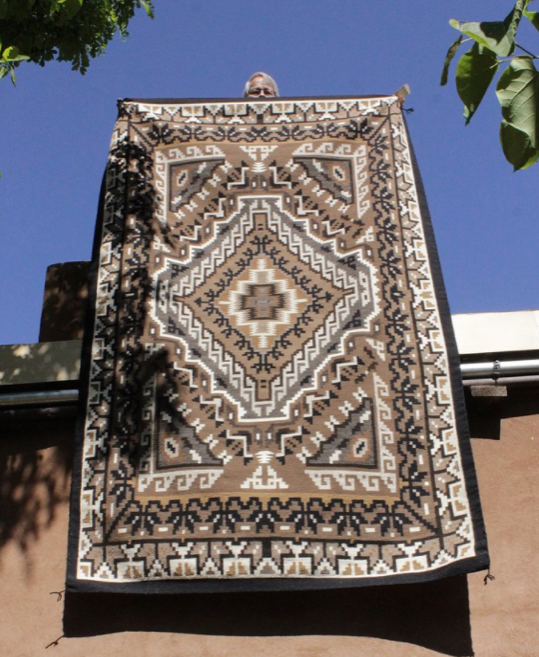 It was hand-woven of wool in natural white, brown and grey and aniline-dye black wool by Shirley Brown in 2013. She is one of the few Two Grey Hill weavers who will occasionally create work of this size. It measures approximately 6 feet 2 inches by 10 feet 4 inches. A beautifully woven Two Grey Hill design by Helen Johnson, 55 by 81 inches. This Klagetoh pattern is 74 by 48.5 inches. Woven in the 1980s this Ganado is a runner - quite difficult to find a runner this size. AS you can see, it has an A & B side due to sun exposure but frankly each side is beautiful: both the dark red side and the more mellow, vintage-feeling side. 96 by 41.5 inches. This Nazlini pattern rug (note the faint pink that sets it apart from a straight Crystal pattern) is not yet for sale. This is the "before" shot of an older textile before being cleaned. We will post an "after" as soon as it comes back...which should be the end of next week (around the 17th. 104 by 64 inches. We will also being have some restoration work done to the selvages. If you have a rug with damaged/broken selvage cords we advise you to have them repaired right away, as once the wefts and warps begin to suffer, the cost of repair work can jump up enormously.